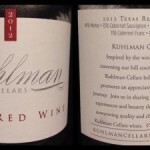 Kuhlman Cellars is a winery which will be opening later this year on Highway 290 in Stonewall, Texas. 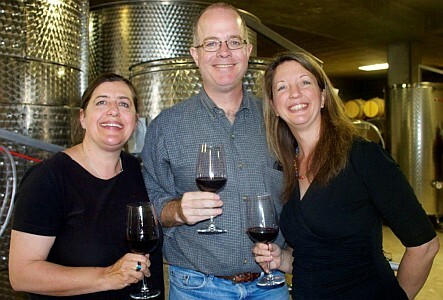 The winery is owned by Chris and Jennifer Cobb, and the winemaker is Bénédicte Rhyne. I first met Chris and Jennifer Cobb at last year’s Newsom Grape Day where they told me about their plans on building a winery along with a vineyard. At the time they expected it might be open in 2015. I saw Chris again at this year’s Newsom Grape Day and they are now expecting an opening in 2014. He told me about their concept for the winery and vineyard, and it was very intriguing with what they will be doing. 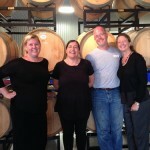 Chris invited us to come by for a preview of their wines the next time we were in Fredericksburg. Fortunately, it wasn’t too soon after the discussion that we arranged for a time to visit Memorial Day weekend. 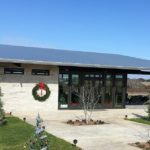 Since Kuhlman Cellars is still being built, they are using a co-op space at Pedernales Cellars. We arrived at Pedernales Cellars and were guided to the co-op space in the upstairs of the winery’s production area. We met the Cobbs there and it was a nice surprise that Bénédicte Rhyne was also present. A table with tablecloth was set up for six people and we each had our own place setting with a personalized tasting menu so we knew where to sit. 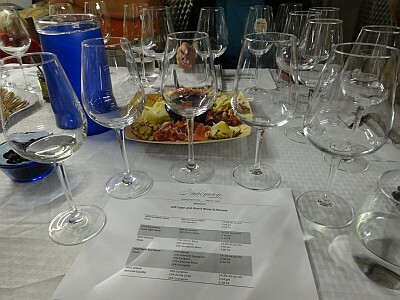 Each place setting had five wine glasses and one water glass. Also available were food platters for pairing with the wines. Chris explained to the group about the upcoming winery and what their current plans are for tastings. 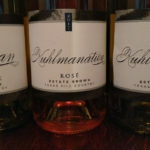 Kuhlman Cellars is named after the nearby Kuhlman Creek and overlooks Lyndon B. Johnson State Park. The winery will be on a lot of 15.5 acres and have a vineyard of 7 acres. 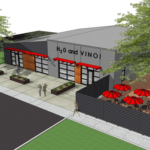 They will use rainwater and recycled water for irrigation of the vineyard. If construction goes as planned, they are hoping for an opening the first part of August. 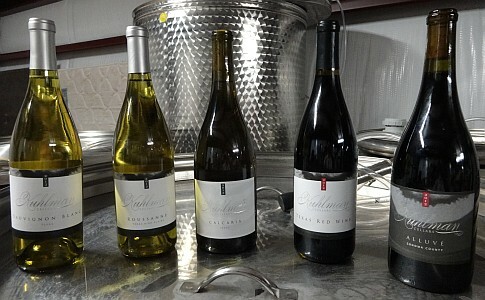 The winery will be available for tastings by appointment only for a $20 tasting fee. The tastings would be just like our table was set up for an intimate one on one experience. A table for two would be available if the appointment was only for two people. They do not want to have a crowd fighting for a wine, but would prefer to share a personal experience with the customers. 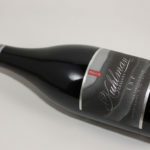 Instead of providing tastings of their wine with one wine glass like most wineries do, Kuhlman Cellars will provide a different wine glass for each wine so there is no possible mixing of the wines. 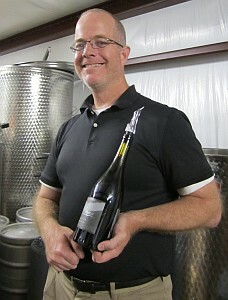 Kuhlman Cellars plans on producing five wines a year with one white, one rosé, and three reds. They believe in using Mediterranean, Italian, and French variety grapes. Their philosophy on wines to be provided is not necessarily being the best Texas wine, but the best wine they can provide. Their other belief is that blends are the best which will be able to handle the different vintages year to year. At the moment, there are no plans for a sweet or sparkling wine. 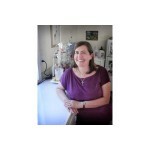 They will use different labels on the bottles based on the variety and blend. Sauvignon Blanc 2013. 88% Sauvignon Blanc from Mesa Vineyards, Fort Stockton and 12% Sémillon from the High Plains. No oak was used. Roussanne 2012. 90% Roussanne from Oswald Vineyard in the High Plains and 10% Chenin Blanc from Mesa Vineyards. No oak was used. Calcaria 2013. 77% Chenin Blanc from Mesa Vineyards, 13% Sémillon from the Pheasant Ridge vineyard, and 10% Sauvignon Blanc from Mesa Vineyards. Calcaria is a Latin word for calcium. This is a blend they want to bring out every year. Texas Red Blend 2012. 47% Merlot, 15% Cabernet Sauvignon, 15% Carignan, 11% Cabernet Franc, and 10% Grenache. Alluvé 2012. 59% Carignan, 22% Petite Sirah, and 19% Grenache. The grapes came from Sonoma County. Chris said that Alluvé is a type of erosion which happens. Barranca. California. This is a blend from Alexander Valley and was used to compare against the Alluvé. Kankar. California. 40% Malbec, 40% Petite Sirah from Dry Creek Valley, and 20% Sangiovese from the Sierra Foothills. During the tasting, Chris, Jennifer, and Bénédicte were very interested in the group’s opinions as to what food paired best with each wine. They also were open to receive any suggestions we had on anything. It was easy to see they obviously want to provide the best possible special experience to their customers. 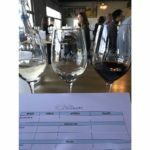 Besides being fun and enjoyable, the tasting had been a great preview for what to expect when Kuhlman Cellars opens, and I know we cannot wait to try it again inside the new winery.